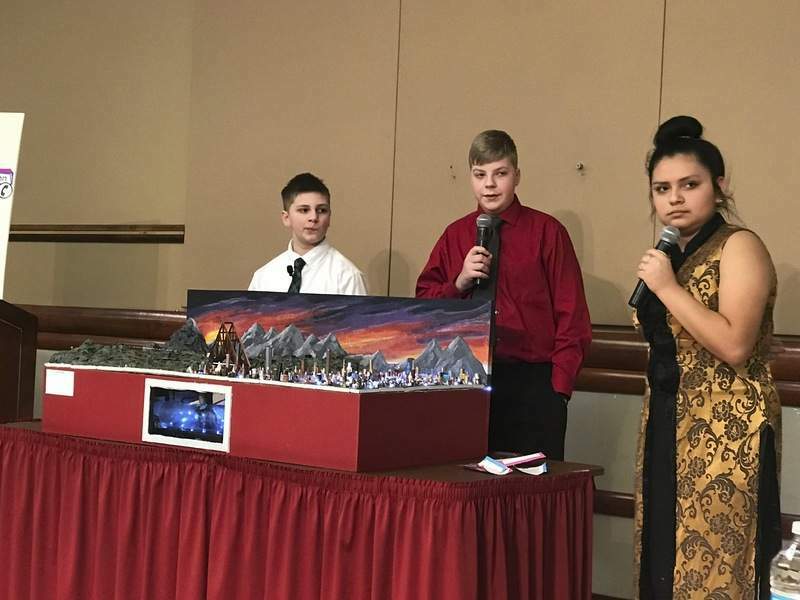 Jamie Duffy | The Journal Gazette Kekionga middle school students, from left, Jude Ratajczak, David Norman and Gaby Gonzalez present the school project in front of a panel of judges at the 2019 Indiana Future City Competition. The project came in fifth overall. Jamie Duffy | The Journal Gazette Kekionga middle school student Makaylee Born, left, and Kate Curless, adviser and math teacher at Kekionga, look over the school's project at the 2019 Indiana Future City Competition Saturday at Purdue University Fort Wayne. The school's project came in fifth overall and took home two "best" awards. The assignment was challenging. Your city has been hit with a natural disaster and you, middle school students, have been chosen to design a resilient power grid that will withstand the devastation. Twelve Hoosier middle school teams with that intent competed Saturday, hoping to win the 2019 Indiana Future City Regional Competition at Purdue Fort Wayne. This year, Blackhawk Middle School placed first among 12 finalists and will compete at the Future City National Finals in Washington, D.C., in February, according to a news release from Carol Dostal, director of outreach programs for PFW's College of Engineering, Technology, and Computer Science. Norwell Middle School came in second and Lane, Jefferson and Kekionga middle schools placed third, fourth and fifth respectively. Kekionga Middle School entered the competition last year for the first time and and came in fourth, giving the team the motivation to compete this year, said Courtney Painter, a math and science teacher at the school who also volunteers to coach the team. The other volunteer coach is Kate Curless, a Kekionga math teacher. Planning for the competition started last fall, when a team of nine students was solidified and the disaster and location were chosen, Painter said. Japan, with its cadre of tsunamis, hurricanes, floods and earthquakes, seemed an ideal selection, Painter said, and so the city of Kurashiki sitting on the Seto Inland Sea was chosen. Some time many decades into the future, Painter said, it was beset with terrible flooding. The students designed an enormous turbine, seen underground with sparkling lights, that would power the city, now renamed Atarashi Kibo, meaning "new hope." Three students were chosen to present the project and answer questions from the judges. The turbine used the power of the flowing floodwaters to power the turbine and generate electricity for the whole city of about a half million people. 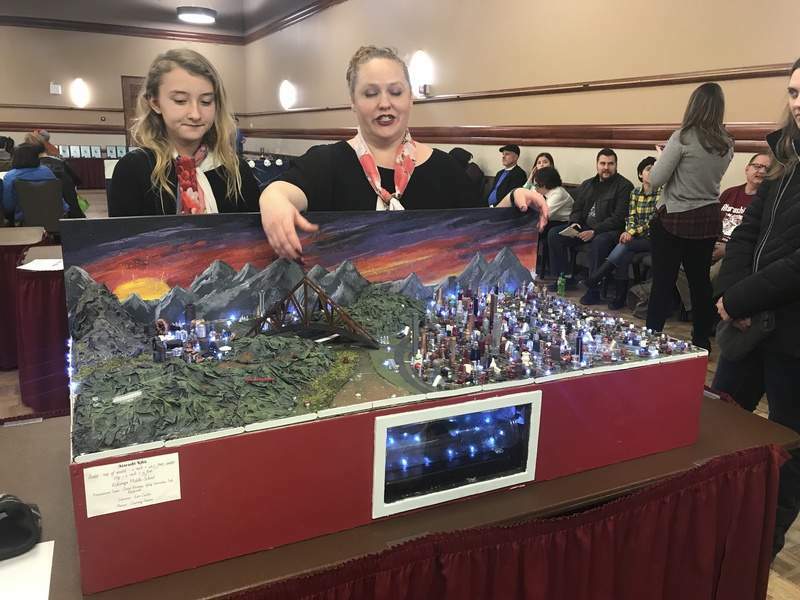 The students stood around the tabletop model depicting mountains, an architecturally beautiful memorial bridge and buildings lit up with blue lights. Though it didn't win the big prize, the Kekionga team won awards for "best artistic vision" and "best use of recycled materials." Kekionga will be back next year, they said, and once again with their eyes on the prize. Sixth grader Makaylee Born followed her brother, Ian Born, an eighth grader, on to the team, "because it looked cool from last year." Other team members included Rory Gadbois, David Norman, Nathaniel Pickett, Jude Ratajczak, Gaby Gonzalez, Cody Hatfield and Evinn DiClementi-Ross. Other teams that competed included three teams from Woodside Middle School, one team from Lane and Jefferson middle schools that did not place, and one each from Memorial Park Middle School and South Putnam Middle School in central Indiana.